Southwest announced this morning that it has started direct service to the caribbean. This is a huge deal as it is likely only a matter of time before they start providing direct service (not through AirTran) to other international destinations, namely Mexico. While the routes are a bit lacking right now things are sure to get better. 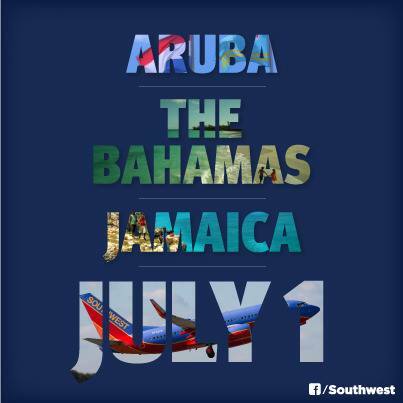 Currently most flights will start in July 2014 with service to Aruba (AUA), Montigo (MBJ) and Nassau (NAS) from a few US airports (namely ATL, BWI and MCO). When southwest.com first showed the new routes for booking at around 12:01am PST I was not sure if Southwest would allow you to use a Companion Pass (see What is the Southwest Companion Pass?). Well the answer is … YES, YES, a million times YES! While fees are generally higher (between $10-70 USD each way) for international destinations Southwest is not charging any fuel tax or surcharges like most legacy carriers. This means that you can fly 2-for-the-price-of-1 to some warm tropical beaches. How to maximize your value? Well if you have a Companion Pass, start booking. I was able to get flights from Atlanta to Aruba for only 9180 rapid rewards points (worth $165 at 1.8 cents each) and added my companion for only $12.50 each way. For less than 20,000 repaid rewards points and $25 we will be able to enjoy a nice long weekend vacation. ← Southwest Starts International Routes !! !